Last night I cooked up the Jerusalem artichoke tubers from my garden to go with dinner. Sadly, my two plants, which ended up topping my fence by quite a bit (and yet for some reason didn’t flower), only produced enough root veggies for me to make a single dinner’s worth. I Googled and found Jamie Oliver’s Jerusalem Artichokes with Garlic in an article titled Top 5 Jerusalem Artichoke Recipes. It looked simple enough that it would let their natural flavour shine through, so I thought I’d give it a go. I’m happy to say that it was a success! 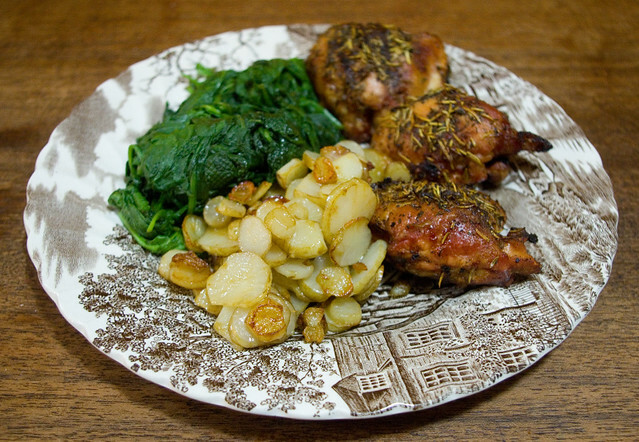 I served the Jerusalem artichokes with barbecued chicken and steamed spinach. The family loved them, and Thing 2 even asked for a second helping of vegetables — how often does that happen? Personally, I was rather surprised by the intensity of their flavour, since they look and smell quite a bit like a rather bland potato. I found them to be sweet and tangy, and utterly delicious. I think I’d like to make them again, but they’re not something that can be found in grocery stores around here. I will have to grow a whole bunch of them next year, I guess! I was a little worried that the Jerusalem artichokes might aggravate my digestive tract, since the Internet is filled with dire warnings of how windy they can make you. I honestly don’t think they affected anyone in the family any worse than the average person eating something like beans or cabbage — definitely not enough of a reaction to be a deterrent for an occasional dish. Mind you, I did cook them thoroughly, which apparently can help break down the inulin (which is a starch that is broken down by bacteria in the colon, causing gas). Apparently regular artichokes have about twice as much inulin as Jerusalem artichokes, so if you’ve never had problems with artichokes before, you probably won’t with these either. Inulin can also be found in chicory, leeks, asparagus, sugar beets, onions, and garlic, among others. So if you’ve never had a problem with any of these foods, you probably won’t with Jerusalem artichokes either. All that being said, if you’re allergic to sunflowers and/or sunflower seeds (which I know some of my friends are), treat Jerusalem artichokes with caution, as they are part of the same family. If you are anaphylactically reactive, I would highly recommend having a professional test before eating Jerusalem artichokes, or simply avoiding them altogether.